Today we are proud to share a major milestone in our journey to offer a B2B search engine with public facing company search that is completely free! 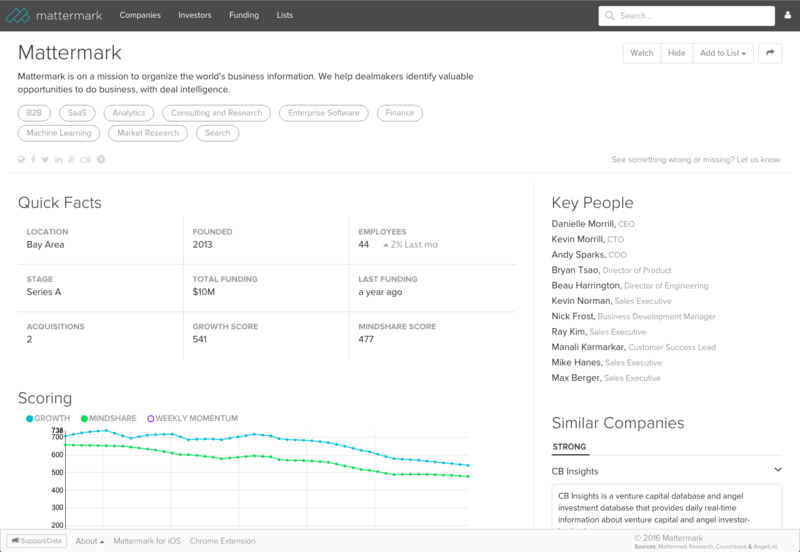 Users who are curious about the size, scale, traction, stage, geography, comps and other key attributes of a company can now find all this information for free in one place. The search result pages from Mattermark are designed to provide users helpful facts quickly, and if they need more data there is always a free trial or research subscription, Salesforce enrichment integration, developer APIs and more. For example, on Mattermark’s free profile you can see that we are located in San Francisco, have raised $10M in total funding, 44 employees, a Growth Score as 541 and are a B2B SaaS company. Why Are We Building B2B Search? The true value of Mattermark lies in sorting and filtering company data to identify investment and sales opportunities (e.g. finding all the Series A SaaS companies in the Bay Area). Basic company facts are helpful to all business people, and our powerful search interface we can engage with as many people in the broader global business ecosystem as possible, regardless of budget. Mattermark is powerful for much more than startup investment research, so next time you are looking to get information about a private company because you are looking for a job, thinking about investing or evaluating them as a sales opportunity, look for them on Mattermark and get the best private company data around.